The New York Jets, after a slow start to the 1981 NFL season, had won five straight games and were 8-4-1 as they faced the Seattle Seahawks on December 6. Granted, Seattle was the last team to have beaten them, but the Jets seemed likely to keep up the momentum. Coached by Walt Michaels, whose job had seemed insecure earlier in the year, they had a productive offense directed by QB Richard Todd, although it was the defense that received most of the publicity – in particular, the line known as “The New York Sack Exchange” that consisted of ends Mark Gastineau and Joe Klecko and tackles Marty Lyons and Abdul Salaam. Seattle had gotten off to a disastrous 1-6 start before beating the Jets in New York. Head Coach Jack Patera’s team had won twice more and was playing better but was at 4-9 coming into the rematch. In addition, Dave Krieg, a little-known second-year backup out of tiny Milton College, was filling in at quarterback for the injured Jim Zorn and making his first pro start. 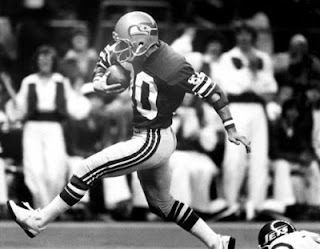 He was fortunate in having a dependable target in star WR Steve Largent (pictured above) and, thanks to a midseason trade, the presence of RB Theotis Brown in the backfield. There were 53,105 fans in attendance at the Kingdome in Seattle. The Seahawks got an early break when the Jets, lined up to punt from their own territory after going three-and-out on the opening possession, had a bad snap get away from punter Chuck Ramsey. Getting the ball at the New York 11, Seattle scored in three plays as Krieg threw to WR Sam McCullum from seven yards out. The extra point attempt failed, however, but the home team was up by 6-0. That was still the situation in the second quarter when the Jets, getting the ball in Seattle territory after Jeff West’s pass from punt formation fell incomplete, scored a touchdown when Richard Todd passed to RB Scott Dierking from 11 yards out. The game remained tied at 6-6, though, when Pat Leahy slipped while attempting the extra point and his low kick was blocked. The Seahawks responded by driving into New York territory as Krieg fired a 20-yard completion to Steve Largent and hit TE John Sawyer for 18. But LB Lance Mehl intercepted a Krieg pass at his own 26 to end the threat. The Jets responded in kind, however, as FS John Harris picked off a long throw by Todd at the Seattle 13 and returned it 14 yards. Two plays later, Krieg connected with Largent for a 48-yard gain to the New York 25, and two plays after that Theotis Brown took a pitchout and went 21 yards for a TD. This time the extra point try was successful and the Seahawks were back in front by 13-6. The Jets used up the remaining 5:15 of the first half with a series that covered 67 yards in 14 plays. Todd completed four passes, including two that converted third downs, and Leahy booted a 26-yard field goal to narrow Seattle’s lead to 13-9 at halftime. New York had a big defensive play to start the third quarter as CB Jerry Holmes intercepted a Krieg pass at the Seattle 28 on the first play from scrimmage. Five plays later Dierking ran for a 15-yard touchdown and, with Leahy’s successful conversion, a 16-13 lead for the Jets. Following a short possession by the Seahawks, New York drove into Seattle territory but Leahy’s 50-yard field goal attempt sailed wide. The home team responded by marching 68 yards down the field in 12 plays. Krieg (pictured at left) completed six straight passes, including a third-and-seven toss to Largent for 11 yards, and finished off the drive with a one-yard quarterback sneak for a touchdown. Seattle was back in front by 20-16 heading into the final period. In the fourth quarter, the Jets advanced once again into Seattle territory as Todd completed passes to WR Johnny “Lam” Jones for 30 yards and HB Bruce Harper for 18. 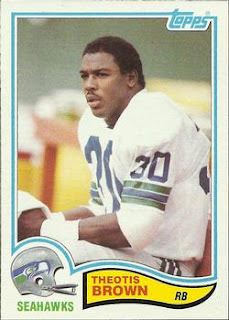 The series ended when Todd threw an incompletion in a fourth-and-one situation, but New York regained the ball a play later after Theotis Brown fumbled and Joe Klecko recovered at the Seattle 35. Todd tossed a one-yard scoring pass to RB Kevin Long and New York was ahead by 23-20 with 9:21 left in the game. It took the Seahawks just two plays from scrimmage to respond. They went 77 yards thanks to a pair of passes to Largent. Largent caught the go-ahead touchdown pass after getting behind safety Jesse Johnson at the 17 yard line and sprinted into the end zone for a 57-yard TD. The Jets were unable to recover. Following a short series, they punted and the Seahawks put together a long drive that ran over five minutes off the clock. Krieg started it off with a 29-yard bootleg and, grinding along on the ground, Seattle reached the New York 25. While Wilson Alvarez’s 43-yard field goal attempt was blocked by Mark Gastineau, there were less than two minutes on the clock as the Jets took over. They were unable to move the ball, with Todd completing just two of seven passes and the Seahawks held on for a 27-23 win. The Jets had the edge in total yards (395 to 383) and first downs (23 to 18). In fact, the statistics across the board were as close as the score indicated. Seattle had more rushing yards (127 to 119) while the Jets had the advantage in passing yards (286 to 264). Each team recorded a sack and was penalized six times. The Seahawks turned the ball over four times to New York’s three. Dave Krieg had a solid performance in his initial start, completing 20 of 26 passes for 264 yards with two touchdowns against three interceptions and rushing for 30 yards on five carries. Steve Largent was the receiving star, catching 7 passes for 169 yards and including the game-winning TD. Theotis Brown ran for 73 yards and a touchdown in 18 attempts. For the Jets, Richard Todd went to the air 51 times and completed 27 of those throws for 286 yards and two touchdowns with two intercepted. Kevin Long was the top runner with 51 yards in 11 carries and Scott Dierking contributed four attempts for 33 yards and a TD and also caught 7 passes for 60 yards and another score. Bruce Harper had 8 pass receptions out of the backfield for 67 yards, both team-leading figures. The loss knocked the Jets out of a first place tie with Miami in the AFC East and temporarily put their playoff chances in doubt, but they won their last two games to finish second in the division with a 10-5-1 record and secured a Wild Card berth in the postseason. They lost their first round game to the division-rival Buffalo Bills, who had come in third. Seattle split its final two contests to end up in the basement of the AFC West at 6-10. Steve Largent was selected to the Pro Bowl for the third time in his Hall of Fame career as he caught 75 passes for 1224 yards (16.3 avg.) and nine touchdowns. The 169 receiving yards against the Jets were his career high at the time, but he would ultimately exceed that total on two occasions. Dave Krieg, who had appeared in just one game as an undrafted rookie in 1980 and threw two incomplete passes, made the most of his opportunity in ’81 and showed promise as he completed 64 of 122 throws (57.1 %) for 843 yards and 7 touchdowns with 5 interceptions. It would be two more years before he would take the starting job away from Jim Zorn for good, but he would play a total of 12 seasons in Seattle, through 1991, before moving on to the Chiefs and would be selected to the Pro Bowl after three of those seasons while the Seahawks made it to the playoffs four times.